Since breaking in with the New Jersey Devils in 1995, Patrik Elias has practically seen it all. Over that time he has been a part of some memorable line combinations. This even dates back to his AHL days at Albany, when Elias was paired with Steve Sullivan and Scott Pellerin and a year later with Petr Sykora and Sergei Brylin. 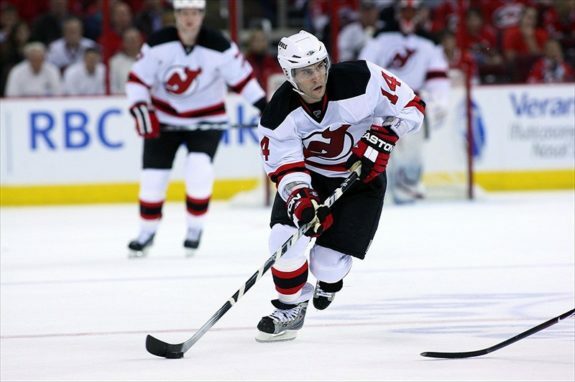 The 2013-14 campaign will be no different, as Elias is once again a top-six forward for New Jersey and acclimates to new teammates, such as Damien Brunner, Jaromir Jagr and Ryane Clowe. For our purposes though, let’s take a look back at the top Elias lines of his Devils tenure. These three were teammates from 2005 to 2011. During that time frame, the three combined for 996 points. Back in 2007-08, head coach Brent Sutter put the trio on ice 19.69% of the time, in even strength situations and 4.34% on the power play. That year the line-mates racked up 161 points and helped the Devils to a 99 point season. During the 2008-09 campaign, Sutter put these three together 38.76% of the time, in even strength situations. That season New Jersey took the Atlantic Division crown, garnering 106 points. In total, the three combined for 178 points. In their run to a Stanley Cup Final, Head Coach Peter DeBoer reunited Elias and Sykora, while also pairing Elias with Zubrus once again. It was almost like old times, with Elias (26) and Sykora (21) each netting over 20 goals and Zubrus chipping in 17. All three were used as a line, in even strength situations, 35.02% of the time. Serving mostly as a second line, the trio amassed a total of 166 points. New Jersey would post 102 points and win the Eastern Conference. Ah yes, the famous “EGG line.” During their time as teammates, the three put up 709 points. With Elias the remaining constant, Gionta and Gomez stepped up to fill in for traded veterans, such as Sykora and Jason Arnott. All three were on the Pat Burns coached, 2002-03 Stanley Cup title winning club and Elias paced the squad with 28 markers and 57 points. In this span, Elias also posted 38 goals in 2003-04, with Gomez leading the NHL in assists with 56. The 2005-06 campaign also saw another banner year for Gomez and Gionta. Gomez posted a career best 33 goals and 84 points and Gionta netted a career high 48 goals, 41 helpers and a team leading 89 points. Saving the best for last, the “A line.” From the 1997-98 season to 2001-02, the three posted 887 points in total. Most notably, under head coach Larry Robinson, the three helped guide the Devils to their second Stanley Cup championship in franchise history, in 1999-00. During that Cup run, they were the top three scorers on the club, totaling 57 points combined. It also saw Arnott notch the Cup winning goal in Game Six against the Dallas Stars, on a saucer pass from Elias. When the three were linked, Elias recorded a career high for goals (40), assists (56) and points (96), in 2000-01. That season would also see Sykora register a career best 35 goals and 81 points. Additionally, Arnott would boast four 20-goal seasons with New Jersey. The NHL regular season schedule was released on Friday. Check out our partners at TiqIQ for the best deals on New Jersey Devils tickets for all 2013-14 games.